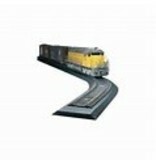 Track-Bed Roll offers a smooth, almost seamless application. It deadens sound, requires no pre-soaking like cork, remains flexible and will not dry out or become brittle. Aligns well with cork or Homasote applications. Also works great for H0n3 and Hon30 gauge.